Old Navy Boyz II Men White Jeans Spot: Memorable! The use of Boyz II Men as the celebrity talent was great, as it hit home with their target audience (assuming I am in the target as a late 20s/early 30s woman). The song choice instantly conjured a positive association (and fondly remember 7th grade), and made me look at the TV to see if it was the real Boyz II Men performing. It was ear-catching! The spot focused on a specific product, white jeans. After watching the spot, I knew that I could go to Old Navy and find an assortment of white jeans. They showcased multiple styles (skinny jeans, flare leg, kids) to convey the idea that regardless of your body type, there may be a cut you’re interested in. Instead of just a “summer styles are here” type messaging, I found the focus on one specific product to be wise and memorable. The price-point was clearly highlighted ($19 for women, $8 for girls). Especially for a seasonal product like white jeans, shoppers likely want to participate in the trend but not spend a fortune on this style. They can so easily get dirty and who knows if you’ll want the same pair next year. Again, very smart in my opinion to not only highlight the availability of the trend, but also display how affordably shoppers can get the product for at Old Navy. Using animation in email has become more common, and continues to catch my attention when used in a compelling way. I received two emails this week that made me stop to look based on the animation alone. I consider these effective at drawing my eye to specific part of the email. Had they not been animated, I likely would have spent less time digesting them. 1) Piperlime – each shoe in this ‘wheel’ appears one by one, so it starts with nothing in the email and quickly fills up with a bunch of cute shoes in a counter-clockwise fashion. I quickly paid attention to each pair of shoes for a moment as it loaded, to see if any of the styles caught my eye. In this sense, the product was truly the hero and Piperlime was able to showcase multiple styles, have me consider them individually, and simultaneously realize that there were a LOT of options within this Dolce Vita sale. 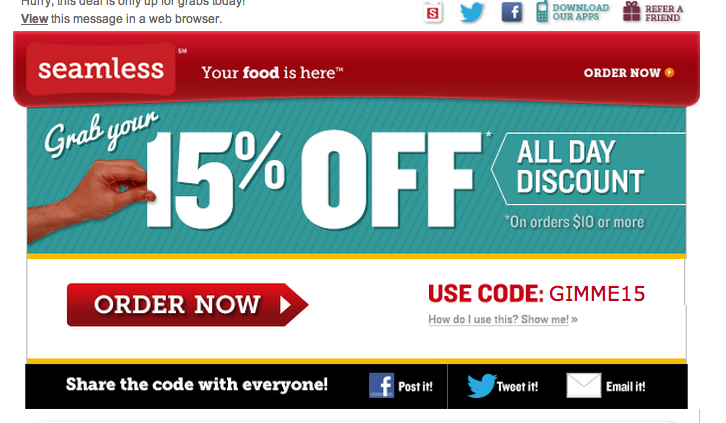 2) Seamless – the hand pointing to the one-day 15% off discount moves in and back out on the left-hand side, leading my eye to pay attention to that specific area of the email and really hammering home the discount % as the focal area. I believe these are two good examples of how companies helped the customer focus on a specific aspect of the email while using simple animation to make the email more unique, fun and memorable than just a basic image alone would have achieved. 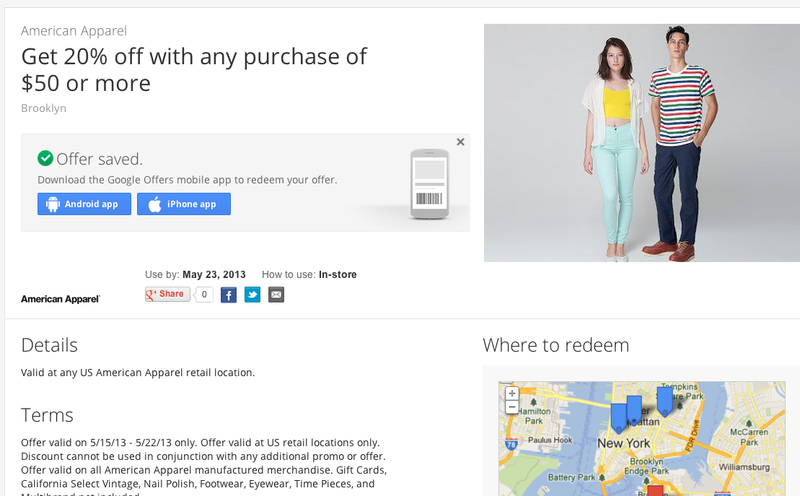 Just ~4 days ago, I received a Google Offer for 20%-off a purchase of $50 or more at an American Apparel store. Once I clicked through and looked at americanapparel.com to see what types of children’s clothing they sell, I decided it may be worth my time to go to one of the physical stores in my neighborhood that day to check it out in person. I went ahead and claimed the Google Offer to use that day (basically once you claim the deal, you can show the cashier the claimed offer on your iphone to get the discount), but I didn’t ultimately redeem it. I did make a purchase while in the store, but it didn’t make the $50 spending threshold so I couldn’t use the Google Offer. Today, I received the below email from American Apparel which I thought was incredibly clever, given the timing – since I had just interacted with the brand a few days prior. 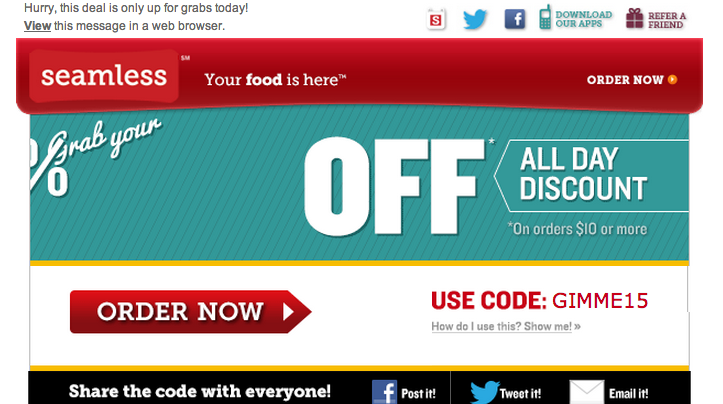 subject: 20% Off Everything! Our Exclusive Deal for You. 1) I’m surprised that my interaction with the Google Offer email seemed to trigger this follow-up email from American Apparel (I didn’t realize Google would pass along the email addresses of those people that claimed the Google Offer). Seems this was the case though. 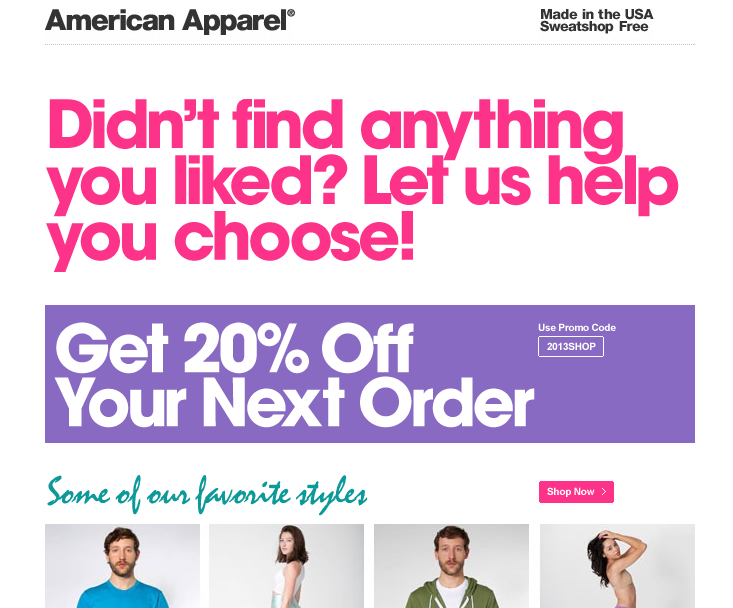 2) Props to American Apparel for using the information of who claimed the offer (expressing their interest) but didn’t redeem it as a way to target those individuals with an online offer as follow-up. Since I had interacted with their brand just a few days prior, this definitely felt relevant. While 20%-off isn’t a stellar offer, the email did get my attention and make me feel they were paying attention to my actions. 3) Even though the messaging didn’t quite apply to me (in my case, I actually DID find something I liked while in store, it just didn’t meet the spending threshold), I still found the timing of this follow-up offer impressive and that they mobilized quickly enough to target those who didn’t claim their Google Offer.